You'll be £12.99 closer to your next £10.00 credit when you purchase The Wills of Our Ancestors. What's this? This introduction is aimed primarily at family historians who are interested in the wills of particular individuals – who are seeking proof of descent – and local historians who are interested in the wealth of local historical information that can be gathered from them. A well written comprehensive guide to wills that no family historian, beginner or more experienced, should be without. The book contains everything you will need to know about wills and inheritance records and although it does concentrate on the English system (radically different from the Scottish one) there are references to Scotland, Ireland, the Isle of Man and also mention of the wills in the British Library's Oriental and India office. As well as an extensive list of pre 1858 Probate Courts in England and Wales, which help the researcher to identify where wills may have been proved, there is a very useful appendix of legal terms and Latin phrases used in testaments. Wills have received increasing attention in recent years as a resource for family historians, aided by online date such as the National Wills Index and Ancestry’s digitisation of the National Probate Calendar. However, there are few books devoted to the subject, making Stuart Raymond’s title a useful in-depth guide to add to the reference shelf. In this book Raymond considers who make wills and why, and their history spanning back to medieval times. He also describes the process of granting probate in detail, and the any different types of information that wills and probate records can offer family historians. This must be on of the most comprehensive discussions of the subject, covering everything from bank of England will extracts to probate litigation records, along with useful appendices on Latin and English terms researchers may come across. Read it for an expert guide to every aspect of wills and probate. The author explains how wills were made and who made them, how the probate system operated and how wills and inventories can be found. In addition to recovering probate records in England and Wales, he includes Ireland, Scotland, the Channel Islands and the Isle of Man. In a series of concise, fact-filled chapters he explains how wills came into being, who made them and how they were made, how the probate system operated, how wills and inventories can be found, and how much can be learned from them. In addition to covering probate records in England and Wales, he includes the Channel Islands, Ireland, the Isle of Man and Scotland. The writing is clear and concise, with many examples of wills from many different parts of England and Wales. This one is of the high standard we have come to expect from his hand. He has concentrated on England and Wales but offers information for those searching the in the UK at large, including the Channel Islands. He has a wealth of knowledge. This he uses to good effect. Ample illustrations are supplied, which are both relevant and informative. Below the picture he gives a translation of any Latin used. I found I was able to enjoy reading it while I learnt a lot about Probates, Inventories, Prerogative Court Archives etc, and how and why they changed over the years. All through the book there are a number of websites, some are pay to view and some free. I tried several and found some useful information. There is am impressive list of further reading, a comprehensive Appendix of where wills are likely to b held, a Latin Glossary, an appendix of terms used in probate record and another of legislation affecting Probate. This book is a good read and is also a good reference book for Family Historians as well as Local Historians. This is a review of sorts - the problem being that the book I'm featuring is one that I haven't finished yet! However, I am so impressed with what I've trawled through already that I want to make sure you're able to get it before Christmas! 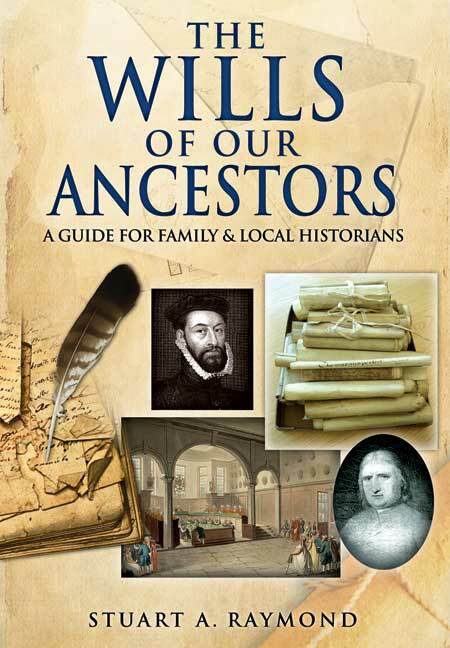 I recently received a copy of Stuart A. Raymond's new book The Wills of Our Ancestors: A Guide for Family and Local Historians, published by Pen and Sword. Often books written down south on apparently universal record types that cover the UK will be primarily about England and Wales, and have a token 2 pages on Scotland and/or Ireland as if somehow they're just an appendix to the main event, instead of a subject that can be as equally complex and detailed as the other two countries of the UK. This book unashamedly states on the first page that it does deal primarily with England and Wales, and doesn't claim otherwise. No problem, that's great - so why am I so excited by it, as an Ulsterman living and working in Scotland, and primarily within Scottish genealogy? Stuart's introduction within the first few pages does something you don't often find when people deal with Britain - it provides an understanding of how the legal systems in both Scotland and England used to deal with probate before the respective Reformations in both countries, and before they went down different routes from the 16th century onwards (1540 down south, 1560s here in Scotland). He starts off with a brief description of how wills originated in feudal England - and by doing so he's allowed me to understand how similar the systems for probate once were north and south of the border. It makes perfect sense, with the two countries using the Roman Catholic ecclesiastical courts for some of the process, and the respective Crowns in both countries to retain controls over the inheritance of land under the feudal system. It's actually quite a short introduction, but it basically allowed me as someone more clued up on the Scottish system to twig how the English system evolved. From this point on it's fairly much about England and Wales all the way, and well written with topics such as the physical process of English probate, the location of records and more. It's incredibly accessible, even for a Johnny Foreigner like me - for example, on page 17 he mentions how a customary law prevailed to 1692 in the Province of York only, which denied testators an unrestricted right to dispose of moveable heritage. They had to give a third of their estate to their widow, a third to the children and then dispose of the final third themselves - exactly the same as the Scottish system (the jus relicate, the legitim and the deid's part). So I'm reading a book about a system I don't normally deal with, and completely on the right wavelength, because he's taken the care to bring me along as an 'outsider' - brilliant. 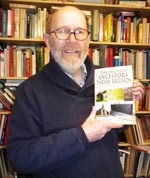 The book is structured to be two thirds background and context etc, with some useful case studies quoted along the way, and then the final third with some useful appendices, including a handy summary of pre-1858 probate courts for England and Wales, a Latin glossary, and other useful resources. If you're looking for a comprehensive guide on the subject, this is it - and if you're overseas, north of the border or just over the water, it makes the subject easily accessible. I'm about a third of the way through it so far - and on what I've read so far, I would thoroughly recommend asking for it for your Christmas stocking! Featuring chapters and heading with straightforward names such as “What can I find in a will?”, Stuart Raymond’s latest book proves to be both easy to navigate and comprehensive. Whether it is information about how to trace wills after the probate restructuring of 1858 or how to extend your search beyond England and Wales, the author’s wealth of knowledge in the field certainly shines through, and his mention of the pitfalls and limitations of the sources clearly derives from his personal experiences. What I found most enjoyable about this book is Raymond’s emphasis on just how much can be provided by these documents – particularly the finer details contained within wills from the Tudor and Stuart periods. Information about locating the documents is especially well researched, and addresses for relevant web pages are included with some handy illustrations and guidance for using them. If you have not yet ventured to investigate these fascinating records, this could be your gateway into a world of discovery.